The pathogenesis of severe malarial disease is not yet fully understood. It is clear that host immunopathology plays a central role, and a recent paper in BMC Evolutionary Biology suggests that the ability of the parasite to stimulate interleukin-10 production is a major factor and speculates on its impact on the coevolution of host and parasite. Plasmodium falciparum malaria is responsible for over 1 million deaths each year, mostly in children under the age of 5 living in sub-Saharan Africa. And yet the number of malaria infections which go on to become life threatening is proportionally very small, as the majority of these infections either remain asymptomatic (due to the acquisition of clinical but non-sterile immunity after repeated exposure) or progress to disease without lethal complications . Viewed in an evolutionary context, the existence of severe disease presents a population-level compromise for the parasite between the necessity of bearing factors that increase survival and transmission and the risk that these will stimulate a host immune response that will either curtail the infection or perversely cause the death of the host (thus also spelling the end for the parasite). With the aim of identifying factors that may be relevant in the evolution of this balance, Long et al. in a recent article in BMC Evolutionary Biology  have investigated the influence of the inflammatory response on the severity of disease in a rodent model of malaria, and we discuss here how their results may bear on the coevolution of parasite and host, in the context of what is known about the determinants of severe malarial disease in humans. Severe malaria can be resolved broadly into two different syndromes: cerebral malaria and severe malarial anemia. Cerebral malaria is associated with impaired consciousness and sometimes convulsions and coma, and can leave those who recover with long-term neurological problems. Its pathophysiology is not fully understood but it is probably due to a combination of the obstruction of cerebral capillaries by parasitized cells and an overactive inflammatory response. Severe malarial anemia occurs when the suppression of erythrocyte production, combined with the destruction of red blood cells by the parasite itself, leads to a particularly profound anemia – which can cause shock and respiratory distress. Both syndromes can involve a range of metabolic complications such as acidosis or hypoglycemia . Both host and parasite factors are likely to contribute to the processes leading to severe disease, and Long et al. have examined one possible interaction using mice infected with different clones of the rodent malaria parasite Plasmodium chabaudi chabaudi. Specifically, they have shown that blockade of the receptor for the anti-inflammatory cytokine interleukin-10 (IL-10) has a dramatic impact on time to death of the infected animal, particularly where the infecting parasite clones are normally avirulent. This result certainly implies that IL-10 plays a fundamental role in controlling the inflammatory response to malaria and that its absence can contribute to the demise of the murine host; Long et al. propose that the ability of the parasite to stimulate IL-10 production is a factor determining its relative virulence. However, whether regulation of the inflammatory response by IL-10 actually plays a part in the evolution of parasite virulence remains an open question and requires a careful consideration of the population-level consequences of interactions between host susceptibility and parasite virulence factors. The best-known host factors affecting the severity of malaria are genetic disorders of hemoglobin such as the sickle-cell trait and alpha-thalassemia. Sickle-cell trait offers protection against both clinical and severe malaria, but the protective effect of alpha-thalassemia seems to be specific to severe malaria, particularly severe malarial anemia . The high frequencies of these genetic disorders seen in malarious regions testify to their significance in modulating the outcome of malarial infection, and the advantage they provide to the host; however, there is little evidence that they have had any impact on the evolution of parasite virulence. This is probably because the mechanisms of protection do not act on any variable features of the parasite. The presence of sickle hemoglobin seems to affect several membrane features of a parasitized erythrocyte [5, 6] that may alter the likelihood that an infected cell will be phagocytosed, and alter the surface properties that allow the parasite to adhere to blood vessel endothelium, thereby avoiding phagocytosis by host macrophages and blocking the vessels. Alpha-thalassemia is associated with microcytosis and a high erythrocyte count, and it has been suggested that this may protect against extreme hemoglobin loss during malarial infection . None of these putative mechanisms would act differentially between parasite genotypes, and they therefore cannot be expected to drive the evolution of virulence. What sort of host factors can we then expect to influence the evolution of parasite virulence? Obvious candidates are the host receptors that allow adherence to endothelial cells by infected erythrocytes – a process that is thought to be fundamental to malaria pathogenesis. Polymorphisms in the endothelial adhesion receptors CD36 and ICAM-1 have been described in malarious areas; however, case control studies have so far given conflicting results as to whether particular alleles do in fact offer protection (reviewed in ). The parasite mediator of cytoadherence is Plasmodium falciparum erythrocyte membrane protein 1 (PfEMP1), encoded by the var gene family, and there is evidence to suggest that the expression of particular subsets of var genes may be associated with different disease outcomes (Figure 1 and reviewed in ). Such variation is likely to be due to differences in the host receptor binding specificity of the PfEMP1 encoded by different var genes. 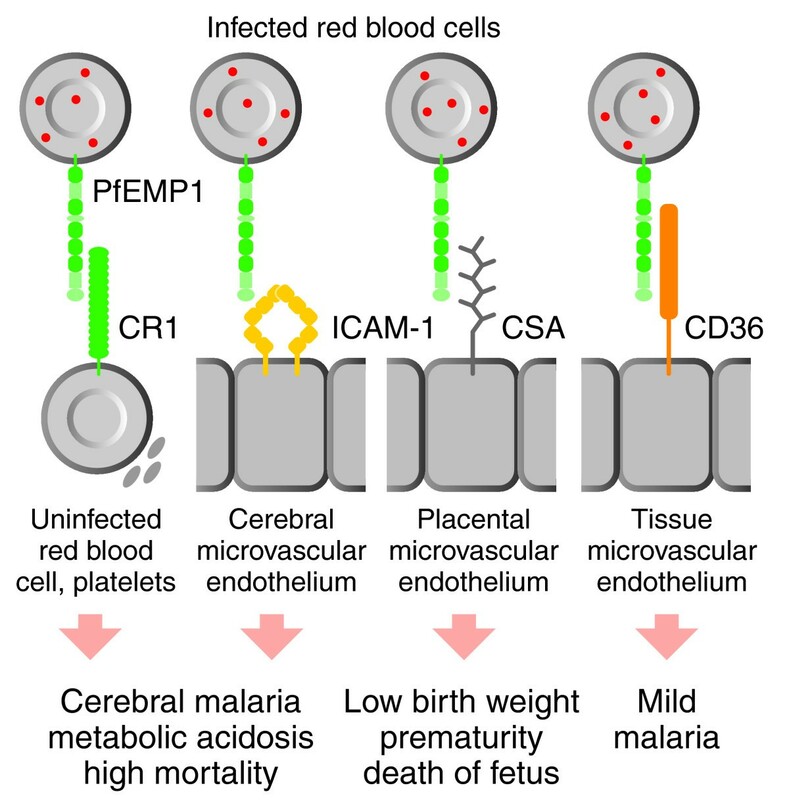 It is well established, for example, that var2csa is associated with binding to the placenta in pregnancy-associated malaria , and a recent study was able to show a correlation between PfEMP1 amino-acid motifs and severe disease phenotypes . Whether these variations reflect the evolution of the parasite population to optimize the survival of both parasite and host remains, however, an open question. Differential binding of the P. falciparum erythrocyte membrane protein (PfEMP1) to host tissues. The parasite protein PfEMP1 is expressed on the surface of infected red blood cells and binds to adhesion proteins chiefly on endothelial cells. Different variants of PfEMP1 bind to adhesion proteins expressed on different endothelia and lead to different disease phenotypes. CR1, ICAM-1, CSA and CD36 are all distinct cellular adhesion molecules. The figure is Figure U11-1.2 from the online update to Immunity: The Immune Response in Infectious and Inflammatory Disease by DeFranco, Locksley and Robertson (New Science Press, London, 2007) . As highlighted by Long et al. , the cytokines of the innate immune response play an extremely significant role in both the prevention and the exacerbation of severe disease. There is ample evidence that higher levels of inflammatory cytokines, such as tumor necrosis factor (TNF) are associated with a higher likelihood of fatal cerebral malaria [1, 8, 11]. Various TNF polymorphisms have been associated with differing susceptibilities to severe malaria (reviewed in ). Other cytokines, such as IL-1 and lymphotoxin, have also been implicated ; indeed, recent evidence from mice (see  and references therein) suggests that lymphotoxin is more fundamental to murine cerebral malaria than is TNF. The findings of Long et al. implicate IL-10 in the prevention of severe disease, and indeed the possibility that IL-10 polymorphisms might affect the severity of malaria has been investigated, although with conflicting results . If the ability of the parasite to stimulate IL-10 production is a determinant of its virulence, as Long et al. suggest, the parasite population might be expected to coevolve with the host towards an optimum at which the level of IL-10 production is sufficient to prevent immunopathology but does not hamper the control of parasitemia through inflammatory processes. Much further work is required to validate such a hypothesis, but it does rightly draw attention to the fine balance that is required between the various arms of the innate immune response to P. falciparum in order to achieve a perfect outcome for the parasite. A further glimpse into the complexities of the immunological processes contributing to severe malaria is provided by migration inhibitory factor (MIF). This pro-inflammatory cytokine was thought to be involved in the pathogenesis of severe malarial anemia, for it appeared to suppress erythropoiesis in mice ; but subsequent studies in humans suffering from malarial anemia have found a negative correlation between MIF level and severity of anemia . Also, a recent study of MIF levels in Gabonese children with differing histories of malaria showed that those children who had only experienced mild malaria tended to have higher MIF levels than those who had only experienced severe malaria . Interestingly, there exists MIF homologs in the genomes of a number of human parasites, including P. falciparum, and it has been demonstrated that falciparum-derived MIF (PfMIF) is present in the sera of malaria patients . That same study also showed that PfMIF has chemotactic effects on human monocytes, at lower concentrations than human MIF. This clearly raises the possibility that parasite-derived factors could act directly to modulate the host immune response and set up a coevolutionary process. To fully understand the evolution of parasite virulence, it must be recognized that the selection pressures imposed on the parasite population by protective factors within the host are likely to change with time, and may even be affected in unpredictable ways by interactions between different host traits. For example, recent work has demonstrated that the two malaria-protective genetic disorders of hemoglobin mentioned earlier (sickle-cell trait and alpha-thalassemia) may interact to cancel out the malaria protection that either affords individually . Finally, the potential for host factors to drive evolution of virulence must be considered in the context of the development of acquired immunity. The initial inflammatory response to the parasite is part of the innate immune response, which provides immediate defence against infection. Acquired immunity develops with a delay and provides long-term protection. There is ample evidence of a positive role for the immune response in protecting against severe disease [1, 8, 17]. The primary selective force on the parasite population is thus as likely to be from the protective immune response as from incidental immunopathology. An interesting model that includes both of these selective forces has been proposed in . It is based on the hypothesis that certain forms of severe malaria result from an excessive T-cell-mediated inflammatory response. Exposure to the malaria parasite (or to an antigenically cross-reacting pathogen) 'primes' naive T cells to recognize it in future, and secondary infection activates those primed cells to release pro-inflammatory cytokines, causing excessive and potentially damaging inflammation. Upon subsequent infections, the various factors contributing to the development of clinical immunity mean that the parasitemia tends to be lower – so providing reduced antigenic stimulation for the primed T cells. In addition, as part of the development of clinical immunity, the predominant T-cell phenotype may switch from Th1 cells (producing pro-inflammatory cytokines) to regulatory T cells (producing anti-inflammatory cytokines). Severe malaria thus occurs in a window of incompletely acquired immunity, where the host immune system responds overzealously to a pathogen it recognizes, without the means to effectively control the inflammation. This hypothetical framework could explain why in malaria-endemic regions, those most at risk of severe malarial disease appear to be young children (who have had some previous exposure to the malaria antigen but who have yet to develop clinical immunity), but for those who visit malarious regions from other areas the risk of severe disease increases with age. The latter could be because it is possible for T cells to be primed to recognize the malaria parasite by exposure to a cross-reacting antigen – the chances of which will increase with age. It is entirely consistent with this model that the probability of severe disease could be reduced among individuals who have better ways of regulating inflammatory processes, thus providing a route by which factors such as IL-10 may affect the severity of disease by modulating the actions of the acquired immune response.